Description ASP3026 is a selective inhibitor of ALK with IC50 value of 3.5 nM. ASP3026 is a selective inhibitor of ALK with IC50 value of 3.5 nM . 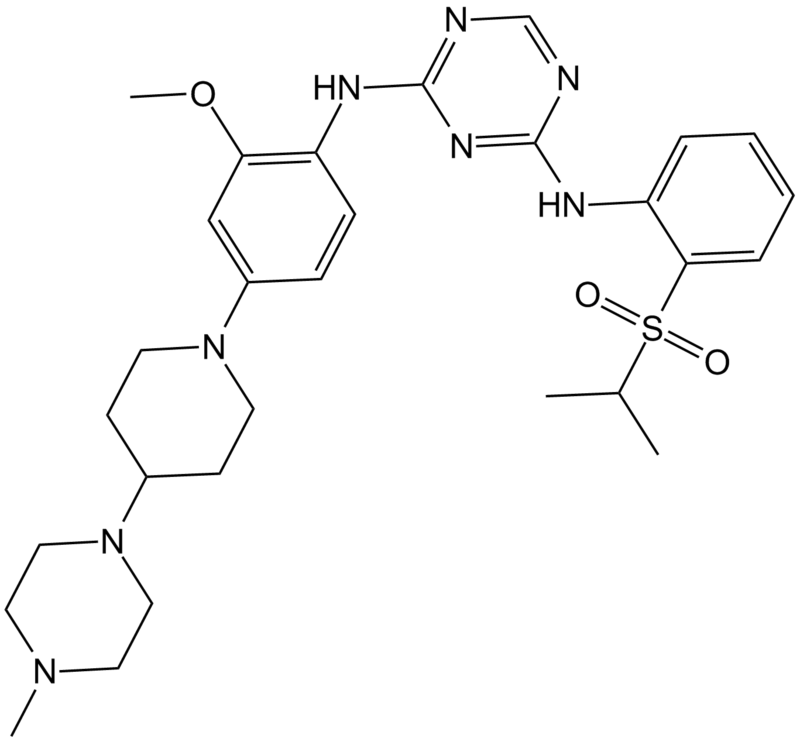 ASP3026 is a potent ALK inhibitor and has a different selectivity with the reported ALK inhibitor crizotinib. When tested with a panel of 86 tyrosine kinases, ASP3026 showed the highest selectivity for ALK, ROS and ACK kinases. In NCI-H2228 NSCLC cells expressing EML4-ALK, five-day treatment of ASP3026 resulted in a cell growth inhibition with IC50 value of 64.8 nM. ASP3026 also inhibited the viability of NPM-ALK+ ALCL cells with IC50 values of 0.4, 0.75, 1 and 2.5 µM in SU-DHL-1, SUP-M2, SR-786 and Karpas 299 cells, respectively [2, 3]. In mouse model with NCI-H2228 subcutaneous xenograft, oral administration of ASP3026 caused significant reduction of phosphorylated ALK and tumor growth. 30 mg/kg/d ASP3026 for 2 weeks induced tumor regression by 78%. In mice injected with Karpas 299 cells, ASP3026 treatment caused remarkable lymphoma regression [2, 3]. Kuromitsu S, Mori M, Shimada I, et al. Anti-tumor activity of ASP3026, a novel and selective ALK inhibitor of anaplastic lymphoma kinase (ALK).Annual Meeting of the American Association for Cancer Research (AACR), Orlando, FL. 2011. Mori M, Ueno Y, Konagai S, et al. The Selective Anaplastic Lymphoma Receptor Tyrosine Kinase Inhibitor ASP3026 Induces Tumor Regression and Prolongs Survival in Non–Small Cell Lung Cancer Model Mice. Molecular cancer therapeutics, 2014, 13(2): 329-340. George S K, Vishwamitra D, Manshouri R, et al. The ALK inhibitor ASP3026 eradicates NPM-ALK+ T-cell anaplastic large-cell lymphoma in vitro and in a systemic xenograft lymphoma model. Oncotarget, 2014, 5(14): 5750-5763.